I just LOVE that this mom had two VBACs after TWO c-sections and she did it twice IN THE HOSPITAL! You have to admit that this is rare. How powerful are women? -So, I would love for you to first give a brief rundown of your first birth/s and what you feel like happened and why you had c-sections. With my first daughter I had just moved back to Oklahoma from Georgia, I didn't have an OB, so when my water broke I just went to the nearest hospital. I wasn't feeling any contractions (I didn't feel a single contraction during my 17 1/2 hours of labor, not even with Pitocin), and because of my water being broken I was told I wasn't allowed off of my back. My labor eventually slowed down so they gave me Pitocin. I still wasn't feeling the contractions and I was progressing slowly so they kept increasing the Pitocin. When I had finally dilated to a 10 they had me purple push which caused fetal distress then they decided I needed an emergency C-section. I think my lack of knowledge is what led to my C-section. I didn't ask questions, I didn't take a childbirth class, and I was a little naive about child birth. Because at 20 I thought I knew everything and honestly how hard could natural childbirth really be? My mom did it after all so I could do it no problem. Then with baby #2 I thought “once a C-section always a C-section” so I set the date and did what I thought was “normal”. -What made you desire a VBAC after your c-section/s? This is almost unheard of these days. Laboring with the first VBA2C, 3rd baby. The next time I got pregnant I knew I didn't want another C-section, wasn't sure there were any other options, I had heard of VBACs but wasn't sure if it was really an option. Major surgery was so hard to recover from and also breastfeeding seemed impossible after having my C-sections. During one of my appointments I saw a framed magazine article featuring my OB it was about women’s rights to choose, repeat C-section or a VBAC. This gave me hope that I wouldn’t have to end up with another C-section. At this point we had already discussed the date of my repeat C-section. So when I saw him that day and he asked me "did we set a date for your C-section? and do you want another C-section?" I told him we hadn't discussed a C-section and I did not want another one, so we started talking about my options of a VBAC and my chances of having a successful one. After this appointment I talked to one of my best friends Tammy. She told me it was possible, I should do it and also suggested that I hire a doula; I did and was one of the best choices I made. With baby #4 I was told that hospital policy had changed, they no longer allowed VBACs after more than 1 C-section. However my OB knew I wouldn’t agree and supported my decision to have another VBAC. I was really so lucky my OB was assigned to me by my insurance company when I had my 2nd child. I was even luckier that he believed that just because you had multiple C-sections didn’t mean your next birth couldn’t be a virginal birth. He made sure I knew the hospital could not force me to have a C-section. He told me to labor at home as long as possible and come in pushing. I had such anxiety with my 3rd birth because it was my first VBAC, it was unknown where as a C-section was the known. I was most likely in labor all day but I thought it was just Braxton Hicks contractions because I had my membranes stripped 3 days earlier. Later that evening I was outside talking to my brother bouncing he asked me if I was trying to bounce that baby out I laughed and told him I just felt like I needed to bounce. At 8pm I knew I was in labor the contractions were lasting 45 seconds and coming every about every 3 minutes; since I had never felt real contractions before they were more overwhelming than I had expected. When I arrived at the hospital I was dialitaed to a 6. Laboring at the hospital was much harder than at home because of continuous EFM and having to stay in bed on my back. Once Brandy (my doula) arrived she got me off my back into a more comfortable position. Brandy and my fiancé also did the double hip squeeze which relieved my back labor. Instead of standing up to deliver I laid down on my back which made it harder. During the time I was pushing I listened to the nurse instead of my body; which resulted in pretty bad tearing. From the 2nd VBAC, fourth baby. With my 4th birth things were much different. I walked at the mall to help speed up my labor. I also labored at home for the majority of the time. Sometimes in bed other times I was in the shower. When I arrived at the hospital I was dilated to an 8 almost a 9. They requested that I be on my back with continuous EFM however, I refused to be on my back. Instead I labored in my bed on my hands and knees until it was time to push. My doctor came in and said are we ready to push? I said yes he asked if I wanted to be standing up or lying down and I replied standing. He got on one side and my fiancé on the other side and they both held me up while I pushed and his intern caught the baby. As for pushing this time I listened to my body and pushed when I felt it was right. This time I had no tearing at all. My motivation to have a successful VBAC was feeling like I was missing something, like I hadn't gone through a rite of passage, also my fear of another C-section and not being able to breastfeed this time. Recovering from my 2nd C-section was extremely hard, I felt like bonding took a long time after both C-sections and I was only able to breastfeed for 6 weeks with my first and 3 months with my 2nd. I watched “The Business of Being Born” several times. I read as much as I could both on the internet and in books. I also talked to my family, friends and my doula. I went into my last 2 births much more educated. I believe that the best thing women can do is educate themselves for the birth they want, and the interventions they can face. With my first VBAC I had a lot of anxiety because this was the unknown, I didn't know what I was doing and was afraid of "failure to progress" and needing interventions like I did with my first birth. Three days before I went in to labor I had my OB strip my membranes, which hurt and I wasn't sure did any good. The day I went in to labor I spent the day with my phone off, off the internet and just coloring and cuddling my 2 older kids, I had no idea I was in labor just thought I was having horrible Braxton Hicks contractions. My contractions (the ones I knew were labor contractions) started at around 8pm after and they started out 45 seconds long and 3 min apart. Since I still wasn't sure how this was going to go I decided to go to the hospital. Once my doula got there she got me off my back and into a position that was better for back labor and helped keep me focused. Also during labor my oldest daughter was there and she was great support she would tell me I was doing great and that she loved me and run her fingers in my hair. I found laboring in the hands and knee position was the best. I kept repeating "I can't do this" my mom and doula would tell me that I was doing it. When it came time to push I laid on my back (which was a mistake) my OB wasn't there the intern seemed unsure what to do so the nurse had me purple pushing. The result was the worst tears my OB said he had ever seen, and he has been doing this a while. Even after her delivery and the painful recovery due to the tears, I knew that it was an easy recovery compared to that of a C-section. It was at that point I knew if I had any more kids it would be another VBAC. 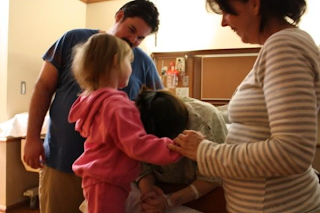 After her birth I still felt like there was so much more that I wish I had done differently. So with VBAC #2 I knew I was going to labor at home as long as possible which also scared me a little because I did not want to deliver in the car, but I also did not want any interventions at the hospital. The day I went into labor with baby #4 my OB stripped my membranes, he wouldn’t be on call that weekend and since the policy had changed I wanted to deliver with him and not have to deal with another doctor that might not be as supportive of my VBAC. That afternoon and early evening I was having contractions so I decided to go walk the mall with my brother and my youngest daughter before dinner, by the time we got home my contractions were about 5 min apart and very strong. I decided to labor alone in my room for a while and then decided to labor in the shower. After I got out of the shower my contractions stopped for a while so I thought maybe it had been false labor and decided to watch some TV. After about an hour the contractions started back up, so I called my doula and asked her to come over, she hadn't been there very long before I decided I thought it was time to go to the hospital. When we got there I was dilated somewhere between 8 and 9, it was at this time I was starting to feel the need to push. At the hospital they moved me to a room and tried to get an IV started, which did not happen. About an hour after arriving at the hospital I told them I really needed to push so I was checked and told I was a 10, my OB walked in and asked me if I wanted to do this standing or lying down I told him standing up, so he helped me up. He was on one side and my fiancé on the other side helping to hold me up while I pushed. This time I pushed when I felt the need to push and no one in the room told me to push or hold my breath. After my son was born the nurse said she had never in her 10 years seen anyone deliver while standing up. After his birth I felt so much better about how it had gone and was very happy with his birth. Now if I have another I want a homebirth!! Victory- a healthy VBA2C baby! After both of my VBACs the recovery time was so much easier and I was able to breastfeed both of my VBAC babies, baby #3 was breastfed until she was 3 and baby #4 is still being breastfed he is currently 15 months old. I knew the recovery time would be shorter and easier but I was surprised at how much easier it was and how short the recovery was, even after the delivery where I tore pretty badly. I was also surprised at how easy breastfeeding was after a VBAC and how much better I felt in general about the birth experience! I love the beautiful umbilical cord in that last photo! I am currently pregnant with #3 after my last 2 being c sec. I am terrified that I will end up with a third c sec. My insurance, the hospital and my Dr are all against a vbac at this point. I have interviews nurse midwives, none of which can help me due to their insurance coverage. Any advice?? Tia!